If you are working in the construction industry, most probably you have heard different types of construction insurance. No matter if you’re building a small house or managing a large pipeline construction project, you need a construction insurance. For many projects it is a contractual requirement to have some kind of specific coverage in order to be awarded. Basically construction insurance provide coverage for your resources (such as material, labor, equipment), risks, unforeseen events, and your company. Insurance firms often aim to provide the latest coverage of every single and unique situation. They have several solutions to compensate any kind of property loss or damage during construction activities. Many cases have shown that without having the right and adequate construction insurance, you can not complete your project on time and budget. Also owners require you to get some of these insurances in order to be qualified to participate in their bidding process. Basically construction companies may face below risks during the execution of the project. Property damages: Damages to the property, materials and/or equipments. Income loss: Income loss due to business interruption. Bodily Injuries: Bodily injuries due to construction activitiesor accidents. Liability risks: Injuries or damages that harm others outside the company. An insurance helps to avoid losing money on a construction project. The specific coverage you choose depends on many factors suc as the size of your project, the number of labor, equipment and the type of the project. Below are some of the most common types of construction insurance policies. Now let’s analyze each type of construction insurance in detail. General liability insurance provides coverage regarding bodily injuries or property damage. Many people mistakenly think that general liability insurance and the builder’s risk insurance provide the same coverage. Therefore they think that these two policies are interchangeable. However, they are two different policies. Contrators general liability insurance does not provide coverage for the contractor’s property or equipment because the builders risk policy provides coverage for them. Typically contractors general liability insurance protects you if someone is injured on your property or your employees cause injury or property damage. Builder’s risk insurance protects the construction itself and provides coverage for materials, equipment and property related to the structure being constructed. It provides coverage for the properties and equipments while they are being used in the construction. Typically a builder’s risk insurance does not provide coverage against the damages arising from theft, earthquake, government action and water damage including flooding. The coverage limit is based on the value of the structure and the coverage ends when the the project is completed. Workers are an important part of your construction project and they are risking their lives everyday due to the works on site. Workers compensation is a type of insurance provides medical and wage benefits to employees who are injured or become ill at work. From this aspect it can be considered as a social insurance. It also provides benefits to families of employees who died on the job. Workers compensation insurance is required in most states. Construction projects often require vehicles and heavy equipments. Commercial vehicle insurance is required to cover the vehicles , trucks, and equipments used in conducting your business. It provides coverage for bodily injuries or property damage to third parties that you cause. Construction projects often cause air and water polution. In most cases chemicals and pollutants are left to spoil the air or contaminate nearby water sources. Contractors Pollution Liability coverage protects contractors against pollution releases. It protects the contractor from third party bodily injury, property damage claims and clean up costs. How Much Does Construction Insurance Cost ? Construction projects typically involve a large amount of money and manpower investment. Life of the workers, equipments, materials, tools and the structure itself is under risk during the construction. Therefore, the cost of a construction insurance varies based on your requirements and the coverage of the insurance. It depends on how many labors you will have, type and cost of equipments you will use and what type of construction work you will perform. Contractors that perform large and sophisticated projects or construct higher value projects will pay more than others. Simply put the cost of the policy depends on the risk perceived with the type of work you are performing. All of the construction projects involve risks that may have destructive effects on the project goals. If you are working in the construction industry, you must be aware of certain types of construction insurance. Business owners don’t want to bear the cost of a potential construction accident. In order to protect your project against damages, you need to have an adequate and quality coverage. The right blend of coverage helps you to minimize your financial risks due to jobsite injuries, damages or accidents that may occur during the execution of your construction project. No matter if you are an owner or a project manager, you will likely want to insurance covering your project if an accident happens. 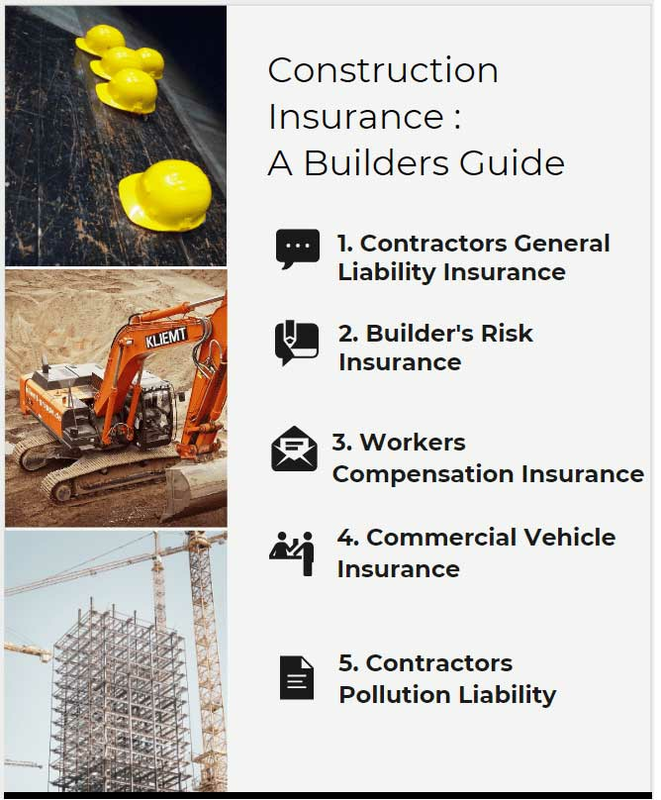 In this article we discuss some of the most common types of construction insurance policies such as general liability insurance, builder’s risk insurance, workers compensation insurance, commercial vehicle insurance and the contractors pollution liability. If you want to add or share something related with construction insurance, you can do so by using the given comments box in below.